No, these are not the traditional black & white cookies – but it was impossible for me not to think of Seinfeld after baking them. Place butter and chocolate in a small saucepan over low heat and stir until melted and smooth. Set aside. In a large bowl, combine the sugar, flour, cocoa, baking powder and salt. Add the vanilla, egg and the butter+chocolate mixture and mix with a spatula or wooden spoon until a smooth dough forms. Turn dough onto a large piece of baking paper and shape into a long cylinder – like Martha does here. Twist the ends and refrigerate until firm, 2-3 hours. Remove the dough cylinder from the baking paper and slice into 5mm thick slices. Place onto prepared baking sheet 2.5cm (1 in) apart. Bake for 8-10 minutes or until the cookies begin to firm up. Cool completely on the sheet over a wire rack. 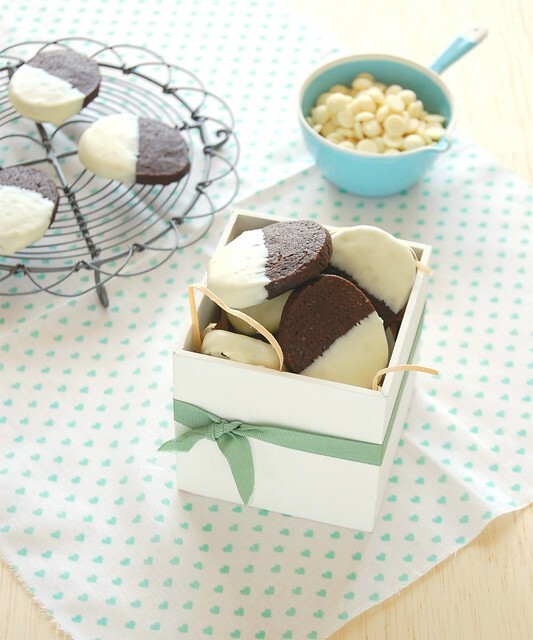 Dip half of each cookie in white chocolate and place onto a rack or piece of baking paper to set – be gently when removing the cookies from the rack or paper because the white chocolate coating might stick to it. They look seriously good! Wow, I could get HUGE from your blog! ha ha! i love your blog. I always come and I said nothing, sorry about it. I enjoy your recipes and photos; they both are delicious. Excuse my bad English. Lovely cookies ... may I have one ? I love your cake cooling rack, may I ask where you got it ? thank you ! My daughters are planning a black and white themed birthday party. These will be PERFECT. I'll be sharing this post with them tonight. Thank you!! These look delicious. I'm so glad i've found your blog! Hi Patricia! I've just found your blog! It's amazing, congrats! And the photography is just stunning! These cookies look delicious, I'll definitely make them! Argone, the rack was a gift from a friend who lives in London.